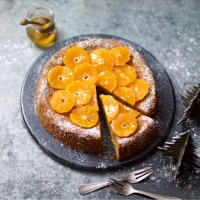 This moist cake is gluten and dairy free and makes a lovely alternative to Christmas cake. 1. Put 4 of the easy peelers in a saucepan and cover with cold water. Bring to the boil and simmer for 25 minutes, then drain and cool slightly. Whizz to a purée in a food processor. 2. Preheat the oven to 180C, gas mark 4. Brush the base and sides of a 23cm springform cake tin with a little oil and line the bottom with baking parchment. In a large bowl, whisk the egg yolks and half the caster sugar until pale and fluffy. In a separate bowl, whisk the egg whites until they form stiff peaks, then whisk in the rest of the sugar. 3. Fold the puréed easy peelers, ground almonds and spice into the egg yolk mixture. Fold a quarter of the egg whites into the mixture to loosen it, then carefully fold in the rest. Pour the mixture into the prepared tin and bake for 55-60 minutes, until a skewer inserted comes out clean. Leave to cool in the tin. 4. Turn the cake out onto a serving plate. Peel the rest of the easy peelers and cut them into slices. Arrange on top of the cake and drizzle over the honey or syrup. Dust with icing sugar and serve.